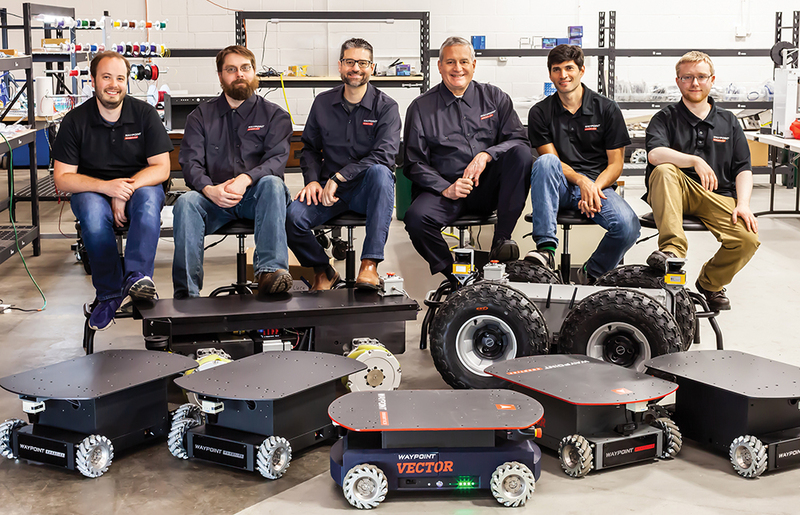 Jason Walker&comma; third from left&comma; and the team with their robots at Waypoint Robotics in Merrimack. Courtesy photo. Jason Walker stands off to the side of the semi-quiet of his factory floor. The room is loaded with shelves arranged for efficiency and neatly stacked with metal parts and rubber bits. Walker noodles on what looks like a tablet strapped to a video game controller; within minutes&comma; the robot at his feet whirs to life&comma; gliding sideways and diagonally&comma; avoiding obstacles. Walker has touched on the key to the robotics industry boom over the past few years. It used to be that it was cost prohibitive for businesses to automate. Robots were expensive and complicated&comma; and it took time and money to find or train labor skilled enough to use and fix them. But not anymore. Robots—whether used to move products on a factory floor&comma; help ailing students telecommute to school&comma; or autonomously vacuum a rug—have become simpler and cheaper&comma; which has been a boon to the industry. While NH is hardly a major player in the robotics industry&comma; it has seen its share of success stories. Among the first robotics companies in NH to take off was MobileRobots Inc.&comma; which launched in 1995. Located in Amherst&comma; MobileRobots designed and manufactured robots&comma; autonomous navigation systems&comma; and software. As the company grew&comma; it attracted the attention of California-based Adept Technology&comma; which acquired MobileRobots in 2010. OMRON Corporation&comma; based in Japan&comma; acquired Adept in 2015. OMRON Adept Technologies did not return calls requesting an interview&comma; but the Twitter feed for MobileRobots&comma; its research and academic division&comma; announced MobileRobots closed in January. The voicemail system at the Amherst location states the NH site is the company’s East Coast product and demo center. VGo Robots&comma; founded in 2007 in Nashua&comma; develops robots that are controlled remotely by a PC&comma; Mac or iPad and have a screen showing the face of the person controlling it to “create a more interactive and mobile videoconferencing experience&comma;” according to its website. 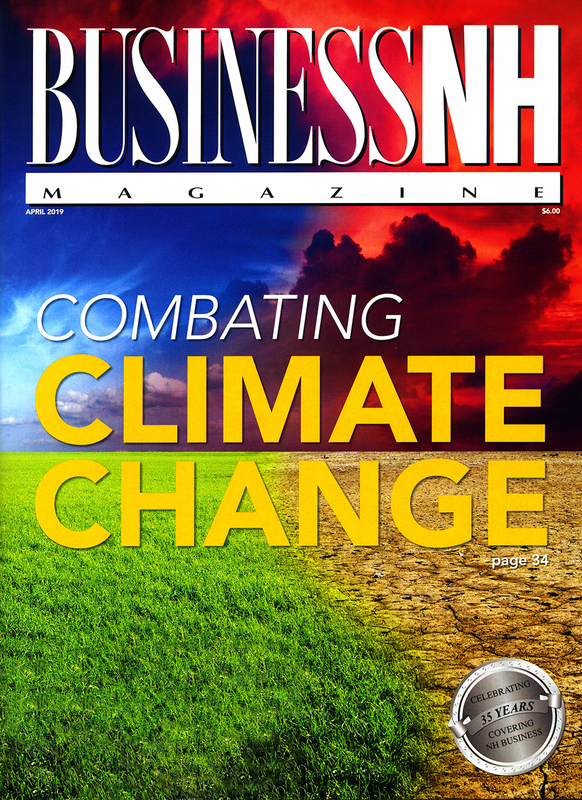 The company gained traction and was acquired by Vecna Technologies in 2015&comma; which relocated the company to Cambridge&comma; Mass. Now Waypoint Robotics has stepped to the fore as the next up-and-coming robotics company in NH. It is not the only NH company hoping to make its mark in the industry. 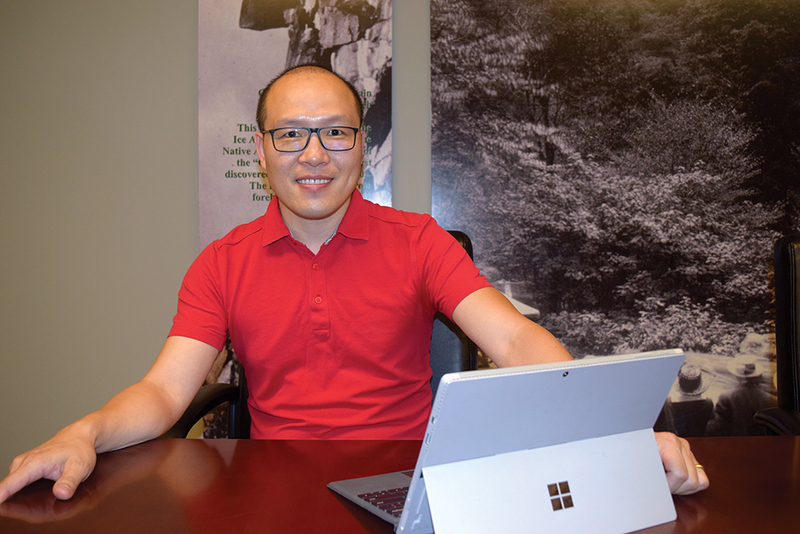 GMRobot Inc.&comma; a startup in Bedford&comma; is focused on robotic and motion control products but has failed to find solid footing since it launched five years ago&comma; says President Yawei Yang. He says that while the company has changed its focus several times&comma; he now has two new partners dedicated to moving the company forward. Yawei Yang&comma; president of GMRobot Inc. Photo by Matthew J. Mowry. Yang says GMRobot is now focused on building robots for the packaging industry and is moving in September to Salem where it has leased a 30&comma;000-square-foot warehouse space. He says the move puts the company closer to Boston and the talent it will need when it begins hiring. GMRobot plans to purchase robotics parts from China and assemble them here&comma; as well as develop the software and motion control in the United States. Yang says the partners are still developing their technology and are in the process of building a prototype. Cirtronics Corporation&comma; a contract manufacturer in Milford that specializes in electromechanical systems and printed circuit board assembly&comma; has found a growing market in the robotics industry. Its foray into that industry began in 2014 when a robotics company approached them for contract manufacturing. “As we worked with our first few customers from the robotics industry&comma; we refined the knowledge and skills to become uniquely qualified to partner with robotics companies&comma; and that has really been a successful strategy&comma;” says Stephanie Gronvall&comma; director of marketing for Cirtronics. The company now manufactures robots for several robotics companies and is in conversations with others. 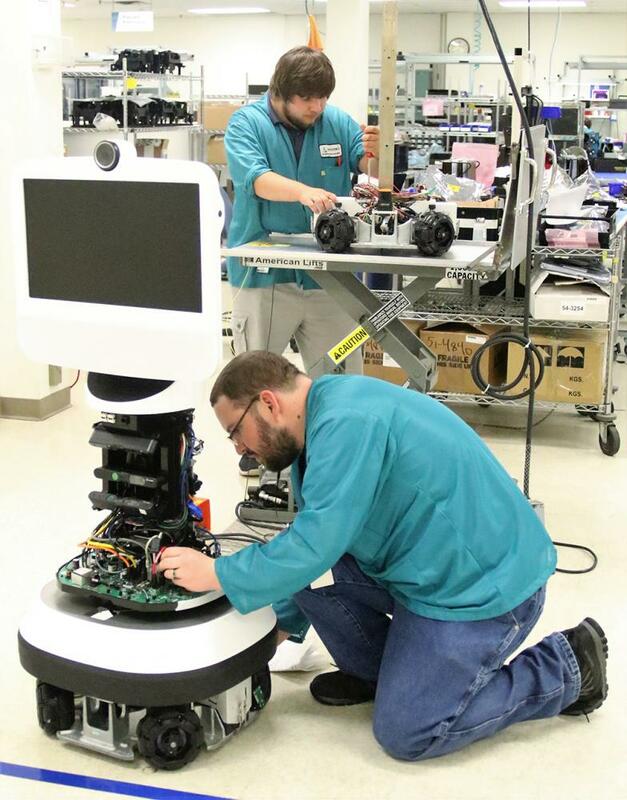 Cirtronics employees work on robots for Ava Robotics. Courtesy photo. “We already have a significant presence in the local robotics manufacturing market&comma; and we expect robotics of all forms to continue to be a growing percentage of our business&comma;” Gronvall says. Among its customers is Ava Robotics in Cambridge&comma; Mass.&comma; which has its Ava telepresence robot built and tested at Cirtronics. “The robots we manufacture are used in a wide range of applications&comma; including military and defense&comma; first responder support&comma; virtual presence&comma; medical and surgical&comma; warehouse automation&comma; and other specialized applications&comma;” she says. But the most influential person in NH’s robotics industry is inventor Dean Kamen and his company&comma; DEKA Research & Development Corp. While robotics is not the focus of the company&comma; there is no mistaking that its innovative technology impacts the industry. DEKA employs 400 professionals and is known for the Segway&comma; the self-balancing personal transporter. Segway&comma; located in Bedford&comma; was acquired in 2015 by Ninebot Inc.&comma; a Beijing-based transportation robotics startup. Ninebot is creating robots for personal and commercial use&comma; such as food deliveries&comma; in addition to transporters. In 2016&comma; DEKA announced it was partnering with Toyota Motor North America to develop the next generation of DEKA’s iBOT&comma; a motorized wheelchair that allows the user to “walk” up and down stairs and rise from a sitting to a standing position. 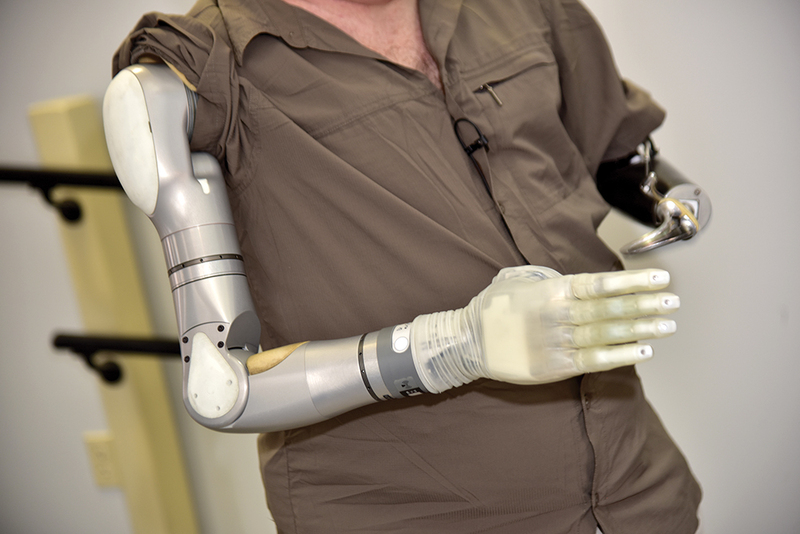 DEKA also developed the technology behind the LUKE arm prosthesis—in essence&comma; a robotic arm—with $40 million in funding from the Defense Advanced Research Projects Agency to benefit veterans with amputations. The LUKE prosthetic arm uses sensors to decode natural muscle signals&comma; essentially translating the amputee’s thoughts into movement. The LUKE arm’s wrist motion combines deviation with flexion and extension&comma; a feature no other prosthetic arm has&comma; to allow it to smoothly change positions when picking up items. Mobius Bionics&comma; a new medical device company in Manchester focused on bringing advanced prosthetic technologies to the commercial market&comma; is manufacturing the LUKE arm. The LUKE arm is among the innovations to come out of DEKA. Courtesy of Next Step Bionics and Prosthetics. Yet the biggest influence of Kamen and his company on the robotics industry is the establishment of FIRST (For Inspiration and Recognition of Science and Technology)&comma; a program based in Manchester. FIRST aims to engage children across the world from kindergarten to high school in mentor-based&comma; research and robotics competitions to inspire them to enter STEM fields (science&comma; technology&comma; engineering&comma; and math). The Robotic Industries Association&comma; the industry’s trade group&comma; estimates that there are now 250&comma;000 robots in use in the U.S.&comma; the third highest level in the world behind Japan and China. The Association reports that a record number of robots were shipped to North American companies in the first quarter of 2018&comma; causing both units shipped and shipment revenue to achieve record levels. The Association also states that 10&comma;730 robots valued at $507 million shipped to North American customers in the opening quarter of the year&comma; representing a growth of 22 percent in units and 3 percent in dollars over the same period in 2017. And that’s significant since 2017 was a record year for the industry. And because the robotics industry is so diverse&comma; ecosystems of specialized businesses&comma; each responsible for a component—such as R&D&comma; design&comma; manufacturing or programming—tend to crop up around it. These ecosystems tend to form around a core of educational institutions&comma; as is the case in Massachusetts. There are dozens of robotics companies in the Boston area&comma; and Walker says it’s one of the largest markets in the country for robotics companies. With that comes a robust robotics community&comma; culture and tribal knowledge&comma; he says. But Walker says some of those professionals don’t want to put up with the commute to Boston and may instead consider working in NH. Cirtronics is positioning itself to help grow the state’s robotics industry with the proposition that companies can focus on developing the technology and tap into Cirtronics’s manufacturing expertise&comma; says Andy McMillan&comma; acting chief marketing officer and chairman of the board of advisors at Cirtronics. He also points out that there are many software companies in the state that can also assist a growing robotics company. Along with that&comma; he says&comma; comes a workforce full of manufacturing engineers and technicians as well as training programs. New Hampshire has a long history of R&D and tech industry presence&comma; says Sridhar Raghavan&comma; NH chairman of the Robotics and Automation Society of NH&comma; an affiliate of the Institute of Electrical and Electronics Engineers (IEEE). Raghavan says there are several reasons for this&comma; including the state’s tax-free status&comma; startup-friendly atmosphere&comma; existing tech talent that runs the gamut from entry-level to expert (particularly in southern NH)&comma; and government that champions the tech sector and efforts to improve it. Employers and the state continue to highlight the quality of life NH offers. “You can do robotics from anywhere…. And the kinds of people who can [perform] robotic design and some of the robotic system components are able to live wherever they want and do their work&comma;” McMillan says. Raghavan says that to accelerate the growth of the industry in the state&comma; there needs to be critical mass&comma; including the addition of a few strong high-tech manufacturing companies&comma; particularly automotive; the addition of one or more national research labs in new and emerging fields; and a major catalytic event&comma; such as a move to the area by Amazon&comma; Google&comma; Tesla or NVDIA. Raghavan also says that the state needs more “incubation belts” around its universities and colleges&comma; particularly Dartmouth College and the University of NH (UNH). Walker agrees&comma; saying that is an area where Massachusetts has the advantage. New Hampshire's colleges and universities do have some robotics offerings. Southern NH University offers an online Bachelor of Science in Information Technologies with a concentration in Robotics and Artificial Intelligence; Plymouth State University offers a Bachelor of Science degree in electromechanical technology and robotics; Manchester Community College offers an advanced manufacturing technology program with robotics as one of three focus pathways; and UNH and Dartmouth College offer a variety of classes and programs geared toward robotics. Walker says leaders in NH’s tech world are all trying to build this ecosystem. 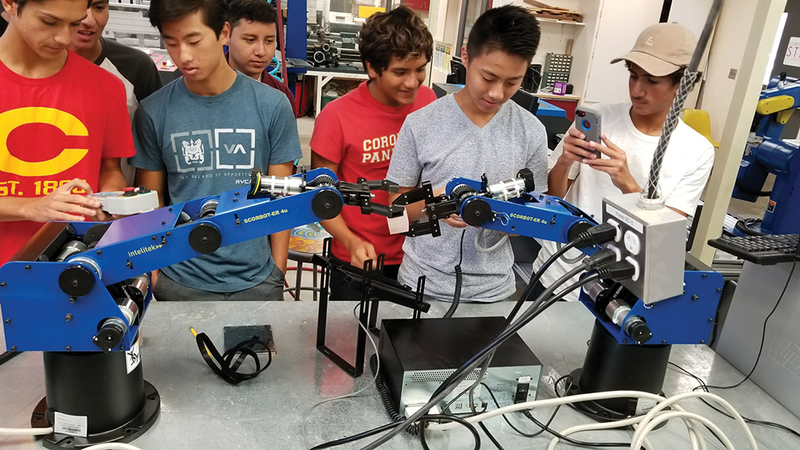 The more they do that&comma; he says&comma; the more&comma; they hope&comma; universities will in turn build curriculum that attracts students who want to pursue robotics. Grossman says colleges and universities are figuring out how to be not just four-year educational institutions but long-term training facilities. “Things happen pretty fast now&comma; and I think they realize that you’re going to have to be retrained a few times&comma;” Grossman says. Ido Yerushalmi&comma; CEO and president of Intelitek&comma; a Derry-based firm that designs high-tech educational and training programs for middle schools&comma; high schools&comma; universities and technical training centers&comma; has noticed this change and says Intelitek has seen an increase in demand for its products. This is a direct result&comma; he says&comma; of the market already needing a workforce with different qualifications than what is currently being offered. Students at Intelitek in Derry. Courtesy photo. Additionally&comma; workers need to know how to communicate with the machines as well as analyze and collect data. “It creates a whole different set of skills that are in need&comma;” Yerushalmi says. Which is why&comma; McMillan points out&comma; that within the scope of robotics&comma; a person could make a career in manufacturing and engineering&comma; quality assurance&comma; and testing and test design among other jobs. Grossman agrees that students not looking into robotics as a career will still likely need to have some working knowledge of automation. For example&comma; Grossman says&comma; when he tours schools in northern NH&comma; he encounters people who don’t see the need to start a FIRST robotics team because those industries aren’t located in that part of the state and so the skills don’t seem as relevant. But he points out that even smaller manufacturing companies are automating&comma; and students need to be educated in&comma; at the very least&comma; how to work with automation. He also points out to them that local industries like maple sugaring may be automated because that will give that local producer the advantage. “Students who don’t know about automation might not be able to compete&comma;” Grossman says. He says he’s fond of quoting Kamen that FIRST is not about using kids to build robots&comma; but using robots to build kids. Kamen says FIRST helps science and technology compete for the attention and hearts of students&comma; which is why it is designed to be a team sport. “You never see a kid running around a sport saying&comma; ‘I want to be second&comma;’ but they would take a math course pass fail&comma;” he says. Kamen adds like any sport&comma; FIRST teaches kids about teamwork&comma; but unlike sports&comma; turning pro is far from out of reach. “In our sport&comma; every kid can turn pro&comma;” Kamen says.